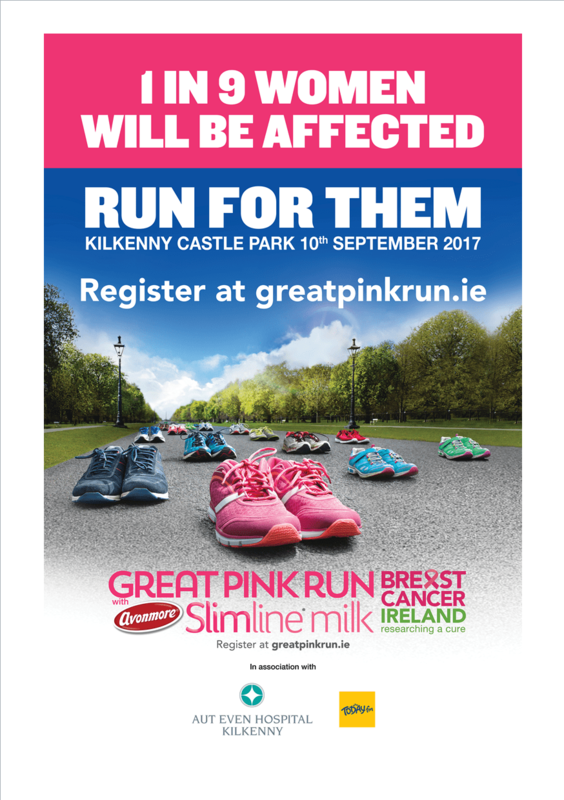 2,800 women are diagnosed with breast cancer each year and on Sunday, 10th September the Great Pink Run with Avonmore Slimline Milk will come to Kilkenny Castle. 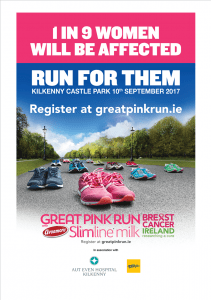 Now in its 7th year, this is the first time the Great Pink Run event will take place at a second location and thanks to sponsors Aut Even Hospital Kilkenny, it is expected the event will attract thousands of runners, joggers and walkers from throughout the midlands and South East region. Women, men and children of all ages will participate across two days (Saturday, 9th September in the Phoenix Park and Sunday, 10th September in Kilkenny Castle) for both the timed 10K challenge and the 5K fun run, with many donning elaborate pink costumes and painting their faces as they support Breast Cancer Ireland’s pioneering research and awareness programmes nationally. The charity plans to extend the run throughout Ireland to other cities in 2018. Registrations are now open at www.breastcancerireland.com/event/great-pink-run or directly at www.greatpinkrun.ie. Breast Cancer Ireland is a registered charity established to raise funds in support of pioneering research and awareness into breast cancer in Ireland. Under the chairmanship of leading breast cancer surgeon, Professor Arnold Hill, the aim is, through research, to transform breast cancer from often being a fatal disease, with over 650 deaths annually, to treatable illness that can be managed long-term. Each presentation of breast cancer is very personal to the individual and through sophisticated analysis doctors can now provide every patient their own tailored, personalised treatment plan for a more effective outcome. Funds raised currently support the ongoing research efforts in the laboratories as well as a national collaborative initiative involving the eight designated cancer centres throughout Ireland. Breast Cancer Ireland have funded the recruitment of specialist Breast Cancer Research Nurses, whose role is to collect and collate patient tissue and serum samples into one large centralised resource, which can now be accessed by clinicians and scientists nationwide, thereby helping to speed up discovery times and ultimately affect more positive treatment outcomes for patients. On average each centre may see on average 9,000 women annually, 300 of whom present with breast cancer. In the past, research efforts were taking on average 2-3 years but today, with this increased volume of samples available, research centres are making good progress towards speeding up our discovery times to within 6-9 months.